If you're having trouble removing your clear aligners or retainers, then this tool is the solution for you! The OrthoKey Tool safely and easily removes clear invisible braces such as TRU-LINE™ and Invisalign®, as well as clear Essix retainers. This product was created and perfected by an Invisalign patient. The OrthoKey pops your aligners out easily and quickly the first time, even when you have attachments on your teeth! It has an angled neck and a multi-grip handle. Comes with full instructions. Watch the video to see how it's done! Each OrthoKey tool is individually wrapped. It comes in white or blue (sorry, color choice not possible). Buy several of them to keep in your purse, backpack, desk, car -- anywhere you need to remove your Invisalign or your clear plastic retainers! If your aligners are very tight, rinse your mouth with warm water before trying to remove them with the OrthoKey. Please note: this item is not returnable due to health regulations. 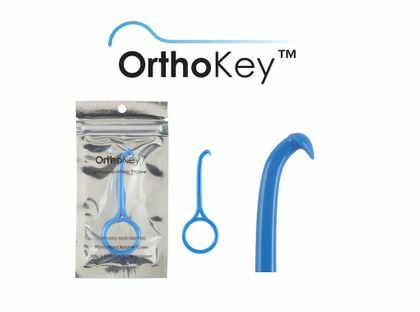 The OrthoKey tool is individually packaged, and comes in blue and white. 1. To remove an aligner or retainer from your top teeth: Position the OrthoKey so that the end of the OrthoKey is parallel to the upper aligner. Latch the OrthoKey from the furthest molar, gently pull up and forward. 2. To remove an aligner or retainer from your bottom teeth: Position the OrthoKey so that the end of the OrthoKey is parallel to the lower aligner. Latch the OrthoKey from the furthest molar, gently pull up and forward. Aggressive or improper use of the tool can result in breakage, if you're having a difficult time in one area, move the OrthoKey to a new position and try again. Do not keep pulling down or pushing up forcefully because this may cause the OrthoKey Tool to break. If your aligners are very tight, rinse your mouth with warm water before trying to remove them with the OrthoKey Tool. Removing Invisalign aligners or clear Essix retainers can be really frustrating. Plus, you need to make sure that your fingers are clean, or you'll be getting all sorts of germs in your mouth. The aligner removal tools we carry help take the frustration out of wearing these appliances. I give the OrthoKey two thumbs up! Plus, it was created by an Invisalign patient, who tested it and perfected the design -- so you know that it really works! My in-office aligner patients love the new device. Works great and saves their fingernails from breaking! I purchased the a different tool on another website and all 6 had broken in a month, so I heard great reviews about the Orthokey and decided to try it out. I'm not disappointed at all, works like a charm!! This is a great tool and a big help and get in my upper retainer off in the morning. My orthodontist specifically gave me a tight fit at the top to help keep my two front teeth together; however, it was so tight it was hurting my nails to get it off. So I ordered one of these tools for 10 bucks and its been great. I just put it in the upper right-hand side and push down and then the left and then grab a little bit in the middle and boom its off. I highly recommend it for the price. This is an must-have tool if you have an Essix retainer. It is so much more hygenic to use, and it is quick and easy. I don't think I could remove mine without it. ProsStrong and easy to use. When I first used it, it took a bit of practice but I love it! I use it all the time. I still have to use my fingers to loosen the front teeth since that's where my attachments are (making it a lot tighter) but it's nice not having to stick my whole fingers in my mouth to loosen the backs of my molars. I keep one with me for home or outings and the other at work. Excellent tool in helping to remove Invisalign trays. I have short nails and couldn't have done it without this. Highly recommend. my dentist claims that my upper tray cracked because of using this tool to remove it. I'll have to keep using it anyway, because my finger nails are too fragile. The tool is easy to use. ProsThe tool is easy to use. saves my fragile finger nails. Consmy dentist claims that my upper tray cracked because of using this tool to remove it. I purchased the orthokey because I was having trouble taking out my Invisalign aligners. It has made a huge difference. 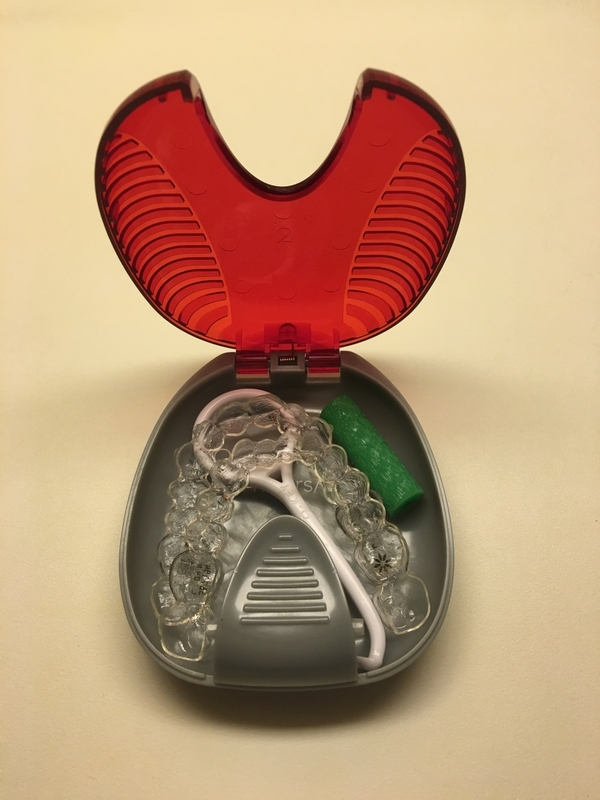 It also fits in the container for your aligners which makes it even more convenient. ProsEasy to use Really works! Handy tool to have in case you are out and need to stop to eat. Works easily. I saw this used on youtube. I am so happy that I made this purchase, I actually got two one for home and one for work...this tool works great...I love it. I liked when I went on your website that there was a video on how to use this tool...Great!!!! I highly recommend this tool!!!! This little tool works like a charm. My new Invisalign retainer was so tight I could not get it out. I did use a metal instrument but the metal against my teeth was awful and it was still a struggle. Using this is a breeze. Greatly recommend this tool. This tool is a life saver and worth every penny. 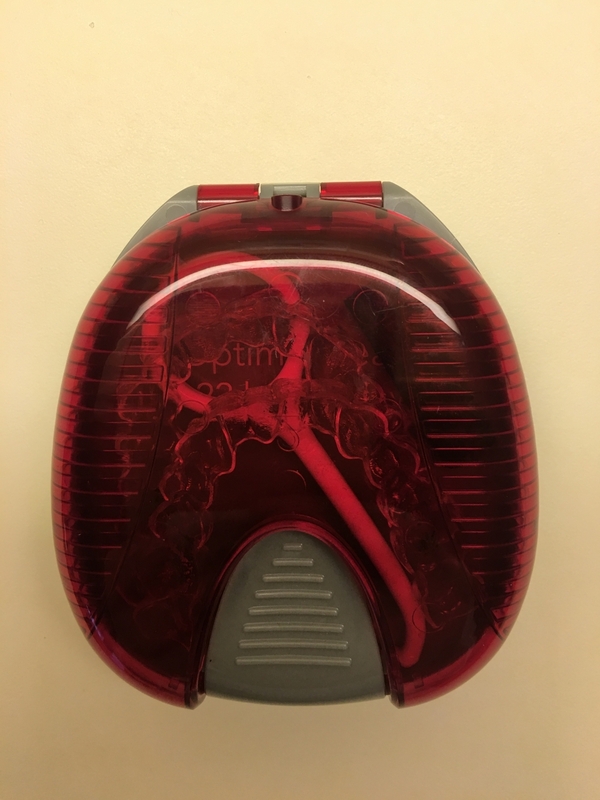 Fits in the red or blue Invisalign case that comes with your Invisalign. I am able to store the ortho key, a chewy, and my aligners all in the case when aligners are out of mouth. Get the 2 pack so you have a spare in case you loose it or if you like to keep one in your second Invisalign case. ProsWorks well to pull aligners out from the inside or outside of teeth - especially if you have a lot of attachments. There are many ways to hold/position w/easy grip and there is no learning curve. I have a small mouth and the corners of my mouth were getting sore from removing my trays. I have had no problems using the remover tool. ProsNot having to stick my fingers in my mouth. I just got invisalign and had so many issues getting them out. Bought multiple remover products and this would be the best if I didn't have so many buttons on my teeth and they are so tight that nothing works unless I loosen the sat back side on either side and use a square of paper towel to pull allinger off. Saved my invisalign experience..... great idea i found. ProsPerfect tool if you dont have alot of buttons on ur teeth. I haven't had to use this yet but I'm sure that it will work just fine. I love this tool!!! I was so happy to find it. I didn't want to use my fingers to remove my Invisalign trays. It was ruining my nails!! The tool my orthodontist gave me was ridiculous. It was impossible to use. I would recommend ordering two! In case one is lost. I'm almost done with my Invisalign & it's lasted for almost a year!! I really struggled to get out my bottom trays, but this tool really helps! So easy to use! This simple little item has made it easy to remove my Invisalign. No broken nails! Better than any other ones I have tried. Let me just start off by saying I never write reviews. However, this little OrthoKey has changed my Invisalign journey. I have 25 attachments on my teeth, so getting my aligners out has been a nightmare. I ordered the OrthoKey on a whim out of desperation, and I'm SO GLAD I DID. I bought the two pack, and I keep one in each case. It makes getting my aligners out MUCH less painful...even on the first few days of a new aligner!!! My orthodontist also told me to give up nail polish for the next year because it would chip while taking my aligners out. Well, the OrthoKey saves my nails too! All around, I am so happy with this purchase, and also kind of upset that all orthodontists don't give these out (or at LEAST tell you about them) when you get Invisalign. Total game changer for me!!! Saves my nails and makes removing my invisalign easier. I have alot of attachments so I struggled before the ortho-key. I recommend it! This tool is just what I needed to remove my Invisalign braces. I dreaded when I put new trays in because they were so hard to remove the first few days. The OrthoKey makes taking them off a breeze; very easy to use. So very glad we found this product. ProsEasy to use. Shape of the tool makes it so much easier to remove my Invisalign's. I'm so glad that somebody invented this! It's so much easier than struggling with using my fingers to remove my Invisalign!